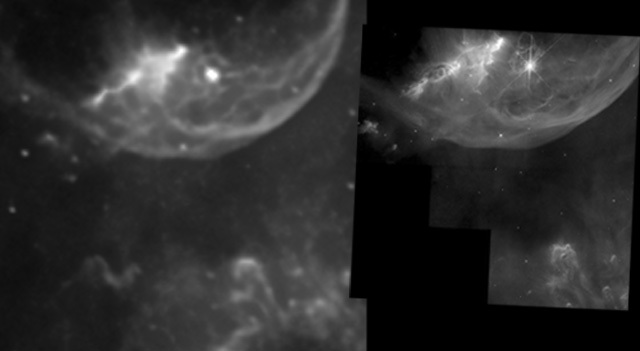 That first test with the Bubble nebula has come out ok. I must confess to getting a little behind with my processing lately. I have that wonderful luxury: The processing backlog! This evening I forced myself to sit down and go back to he beginning of the pile. This is 4 hours of Ha data on the Bubble which was collected during the first major test run of the homebrew off axis guider. The image of the bubble nebula is under this link.. I'm pretty happy with the level of detail I can now potentially get. Don't forget we are still talking about an LXD55 mount and a bargain basement 8inch F5 newtonian. One which is quite a few years old now as well I might Add. Taking ourselves back in time to 2 years ago in 2005, we imaged the bubble nebula with our SC3 webcam and got some nice colour and detail. With the Off axis guider working now I am getting the sort of detail using 20 minute subs that I used to get in those heady days of banging off a few billion 30 second subs. Shortly after processing this image I found myself looking at the Hubble shots of this region . Wow. They are super hi res. I'm not likely to approach that on my budget (orbital launches are still prohibitively expensive) but it is fun to compre the hubble image with my own after some suitable re-sizeing. The comparison images below clearly show I need to tidy up my stars. Now I've got my tracking well sorted, and the impending fast guider, it might be time to start thinking about new mirrors and better optics.